The Green Terror Cichlid also known as the Adinoacara Rivulatus is a beautiful, robust and colorful cichlid originating in South American waters. There are a few different varieties in the Green Terror family, the white saum and gold saum, each of which features a corresponding dorsal and tail fins.These color differences along with the overall vibrancy of the fish are the only differentiating features. True to their name the Green Terror can be quite the terror in an aquarium. From my personal experience the aggression in some specimens starts earlier than others but overall any like sized or smaller fish will be tested by the Green Terror. While their mouth is relatively small when compared with Red Devils, Jack Dempsey, Oscars and other American cichlids the Green Terror packs a decent bite. When full grown a male can reach sizes of up to 12 inches, while females with tap out around 8 to 10 inches. Both sexes will reach sexual maturity and be ready to spawn around 4 inches. When young some specimens might not look too impressive but when mature I think the Green Terror is one of the most beautiful fresh water fish in the aquarium hobby. A mature Adinoacara Rivulatus male will be bright and colorful and sometimes feature a prominent nuchal hump on its forehead. On the other hand a mature female might not be as colorful and will almost never show a nuchal hump. This is really one of the main ways to identify a male from a female Green Terror, in addition you might look for a long pointed dorsal fin in a male versus a shorter rounded fin in the female. 1.1 How Long Do Green Terror Fish Live? 1.3 Good Green Terror Tank Mates? Not to ever be down played is the need for a large aquarium when keeping Green Terrors. This is a large territorial fish with teeth! So you’ll want a pretty big aquarium at least 60 gallons with plenty of hiding places if you are keeping more than one fish in your tank. To maintain high water quality you’ll also want to perform weekly water changes adding in a nice conditioner like Sea-chem Prime. Proper filtration is also key, you’ll want a nice canister filter that can keep up with your tanks bio load (this varies by stocking and aquarium size). For more information on aquarium filtration read this full guide. If you are keeping smaller sized fish to start I’ve found including a few cichlid stones is very helpful in providing each fish with its own territory and sufficient hiding place! How Long Do Green Terror Fish Live? Keeping Green Terror or any other fish you want to be in it for the long haul, giving your fish great living conditions and a nice diet so that they can thrive for a long time. Being such a hardy fish the Green Terror can live up to 10 years in captivity. A long life is needed for a Green Terror to each its full size, as these guys are relatively slow growers. Unlike big time eaters like the Flowerhorn, Midas or Jack Dempsey the Adinoacara will eat but not like a pig which ultimately make them slower growers. Most fish keepers dream is to get their fish to pair off and breed. If this is your ultimate goal with your Green Terrors here are a few things you’ll need to make sure of to be successful. Never force a breeding pair! Just because you have a male and female specimen that doesn’t mean they will bond and ultimately spawn. The best way to go about pairing your Green Terrors is to buy a few specimen, maybe 1 male and 2 or 3 females. Approaching in this way you’ll give the fish the option of pairing while you only suggest the mate. Things will happen a lot more natural when does this way. However be careful and ready to move the other fish if needed into a difference aquarium as breeding pairs will become ultra aggressive to any potential threats to their eggs. 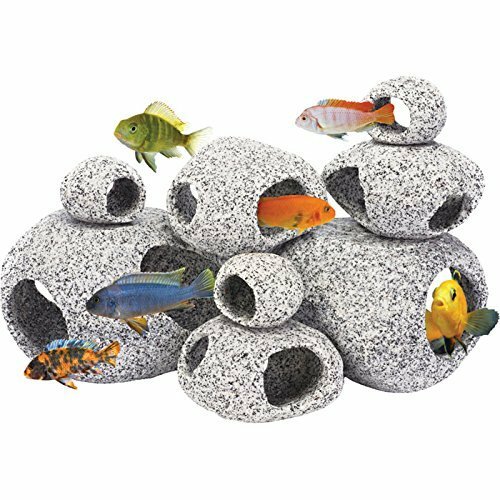 Along with a pair of fish and clean water you’ll want to make sure that you have substrate and a flat surface like a rock or nice piece of driftwood for the fish to lay eggs on. Green Terrors share substrate spawning in common with a lot of the other cichlid species so it is crucial to the breeding process. If you are successful in getting your fish to spawn watch over the new fishy family close. Sometimes the parents will begin eating the newly hatched fry, this isn’t a problem for your fishes health but if you are looking to keep a lot of the fry moving them might a good idea. Good Green Terror Tank Mates? Since Green Terrors are aggressive and pretty large you’ll want to keep very similar fish with them. However unless you want a royal rumble resulting in stressed out fish you’ll need more space for tank mates. Even for a breeding pair of Green Terrors I’d suggest nothing smaller than a 90 gallon aquarium. For a mixed tank with various aggressive species we’d recommend a 90 to 125 gallon aquarium. While you could probably get away with a 75 gallon your fish will be less stressed and can each carve out a little bit of territory in the large sized tank. Red Devil, Jaguar, Jack Dempsey, Red Terror, Oscar, Arowana, Midas, Convict and Firemouth are all good fish to keep with the Green Terror. You might have some altercations but keeping a minimum of 4 or 5 fish in a large aquarium will prevent ganging up on any one fish and keep fights to a minimum. Overall the Green Terror is a beautiful and entertaining fish. They are hardy and relatively easy to keep making them the perfect fish for a beginner to intermediate fish keeper. The bright colors make them attractive and a nice addition to any aquarium. Always remember that the Green Terror has “terror” in its name for a reason and can be aggressive. A large aquarium is needed! ← Flowerhorn Fish Price, Too Much?